ELKHART — The Gateway Mile in downtown Elkhart is noted for its galleries and museums. Now, it’s being recognized for its art served on plates. Artisan by Kurt Janowsky has received the coveted four-diamond rating by AAA. The fine dining restaurant at 505 S. Main St. is joining the exclusive list in its first year of operation, a true rarity as only about 700 restaurants in North America ever make it to such a high level. For 80 years, AAA has conducted in-person, independent evaluations of restaurants and hotels. Operators cannot pay to be evaluated or influence the process. In 2015, only 34 restaurants were added to the four-diamond list, while 44 previously rated establishments failed to keep the designation. Restaurants may request the reviewer’s notes after ratings are established, but as yet, Janowsky said Artisan does not have that information. 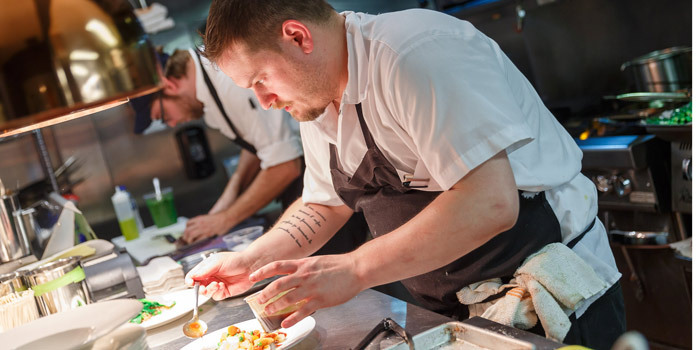 Only five Indiana restaurants are rated four diamonds by AAA: Artisan in Elkhart, Restaurant Tallent in Bloomington, Joseph Decuis in Roanoke, and Carriage House and LaSalle Grill in South Bend. Janowsky said that spirit runs through the Gateway Mile. Artisan is open Tuesday through Saturday, with bar service available at 4:30 p.m. and the dining room open at 5. A private room able to accommodate up to 100 guests also is available for booking. Call (574) 355-3355 for more information and reservations, or visit ArtisanElkhart.com for full details. Information on all downtown assets is available at GatewayMile.com.